I see this getting "Charge" replaced "by "Rush" now that the new mechanic is coming out. This card should read in the upcoming nerf cycle. "Whenever this minion is summoned discard 2 cards." For balance purposes. Perhaps 'Battlecry: Charge + Discard' change. If ice block doesn't get HOF'd then why should this card go to hall of fame? Encouraging people to play Zoo and Aggro decks, terrible card design 2/5. Can I swap 2 sea giants for 2 doomcallers? Why doomcallers??? R U Playing C'thun lock??? Hands down my favorite card. 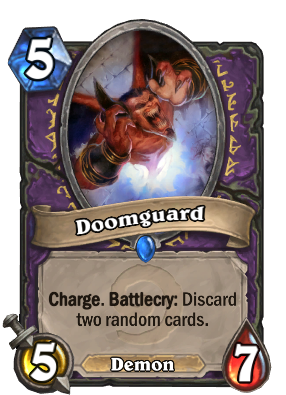 Even with the discard 2 it's a great finisher and if you get it out for cheap with void caller, it contests most minions on the board and can remove 2-4 of them. The high damage and incredibly high health is just fantastic. Every card game ever = No cards to discard? Can't play it. Hearthstone: Waste your hand to gain advantage, drop Doomguard = win.